This past week seems to have been nothing but a big blur. I was putting away laundry on Friday and watching president orange in the Rose Garden announcing the end of the government shutdown. I really debated whether to keep it on or turn it off. I kept it on only to see how badly this would go. 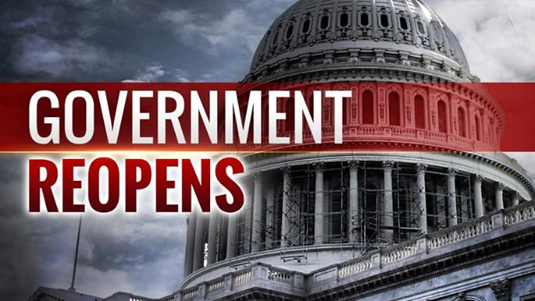 • The US government re-opens. Yes, the government was going to reopen. I was just wondering what this shutdown actually cost. Newspapers reported the cost of the shut down at $11 billion, according to the a report in the New York Times, on 28 January 2019. I don't understand how that figure was calculated and how it was more than that stupid wall the president wants to build. The irony is the president accepted this bill from Congress and it was the same on presented to him at the beginning. Yes, he accepted responsibility for the shutdown. He said he would keep the government closed for as look as it took to get his way. Well, president baby man didn't get his way. His poll approval numbers sunk to all-time lows, something like 35%. If that isn't a clear sign that the American people don't like what you're doing, I don't know what to say. I was just wondering the entire time how this would affect the boyfriend of one of my daughters. He currently works for a Transport Security Administration (TSA) contractor in Florida. He put in a transfer to Albany, New York, to work for the TSA directly. How would this affect him? He had tried calling the TSA Human Resources department, but got a message the office had closed due to the government shutdown. Then, two days later, he got a call saying someone had approved his transfer and he was to report for orientation on 19 February. We were all very happy, but concerned whether his pay would be forthcoming or not. He has a grandmother that lives near Albany. I suggested he live with her for a few weeks to save some money and then find an apartment if the shutdown was still in effect. That became a moot point, as the shutdown is over, at least for three weeks. I really can't see president orange demanding another shutdown when this agreement expires. I think that would be political suicide. I don't think he cares what the American people really think; he just wants that damn wall to sooth his base. • Border security and no wall. The Democrats agreed to provide funding for increased border security, including drones, cameras and more border guards. It would also make sense to build more field offices to patrol the areas breached most often. I believe had the shutdown continued any longer, utter chaos would have reigned in Washington, DC. The Republicans would have no choice but to vote with the Democrats on bills to reopen the government. Then the other shoe dropped, with trump advisor Roger Stone arrested on many charges having to do with campaign and voting fraud. Now, I'm wondering when Congress will begin impeachment hearings against our idiot president, who should be thrown in jail with the rest of his complicit family and left to rot without his hairspray. I wonder of many things. The biggest one is how in the heck did this country actually elect a failed businessperson to the highest office in the country? How many small and family run businesses did Trump ruin by refusing to pay his bills, only paying a portion of them or waiting for a lawsuit for non-payment so he could negotiate a settlement? Most of this happened in Atlantic City when he was building his casinos. This should have been a huge clue to the voters what kind of man this was. Trump had a fake university and more failed businesses than successful ones. He declared bankruptcy more times than the average person. Then, again, he always said he was more than average. • Led from White House in handcuffs. Now our country is paying the price. Eventually, Congress is going to get the results of the Mueller investigation and have a field day as the FBI escorts him out of the White House in handcuffs. We can only hope that day is soon.